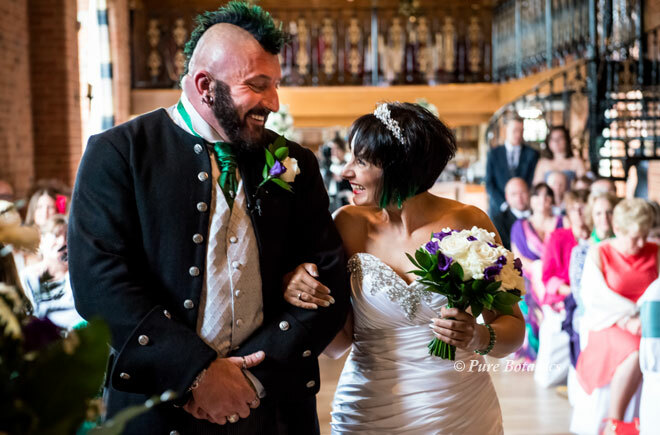 When the groom has a green mohican and the bride has matching green hair tips you know it’s going to be a wedding with a difference. 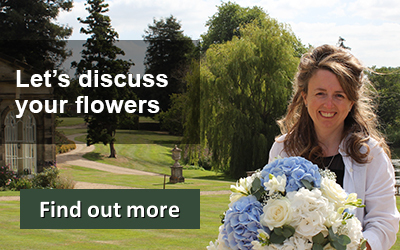 From my very first meeting with Sara (the bride below) I knew colour was going to be the most important aspect of her wedding flowers. Everything was always going to be a little different and on the day Sara arrived at Ingon Manor in a helicopter. 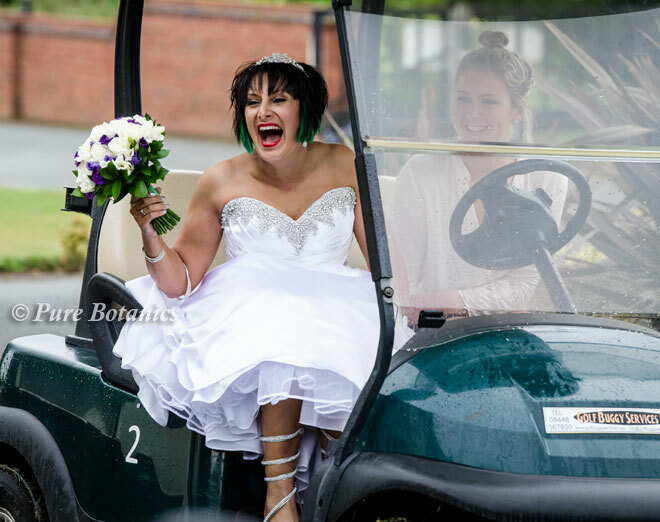 She was then transported from the grounds to the ceremony in the golf buggy. I think you can see from the smile on her face the day had started with great excitement. 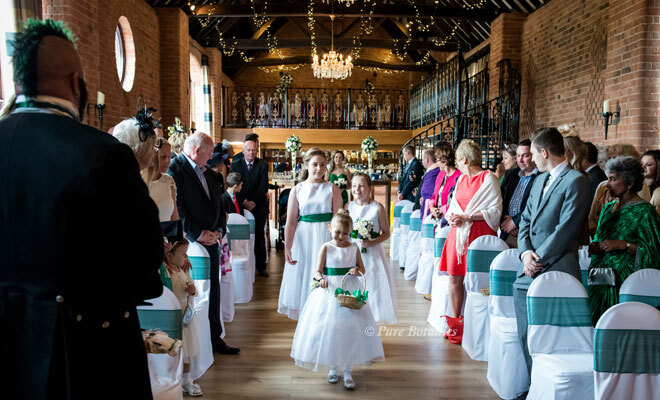 Every age group was involved in the wedding ceremony from the cute young flower girls (below) and ring bearer (above) to Sara’s dad who walked her down the aisle. 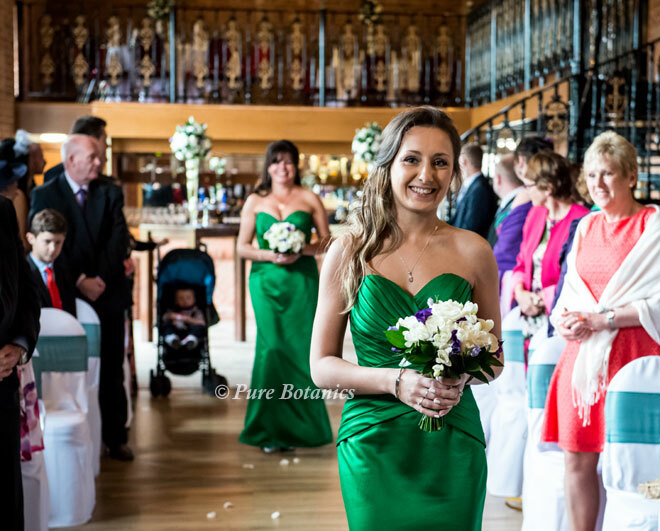 Once the bridesmaids dresses were chosen then the colour was set to be the stunning emerald green you can see in all the bridesmaids dresses and gent’s cravats. 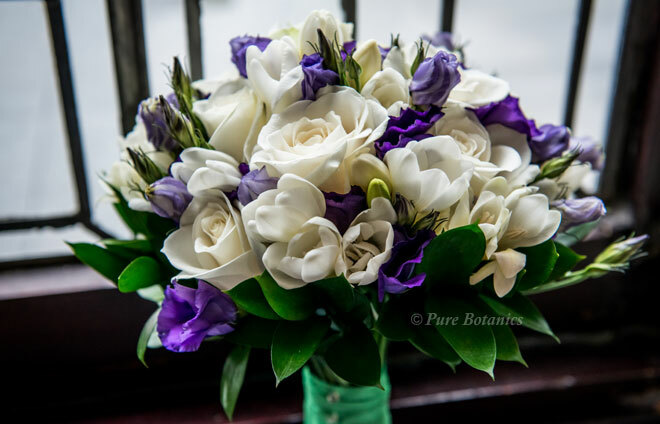 As there aren’t any emerald green flowers Sara chose ivory roses, freesias, purple lisianthus and dark green ruscus leaves. 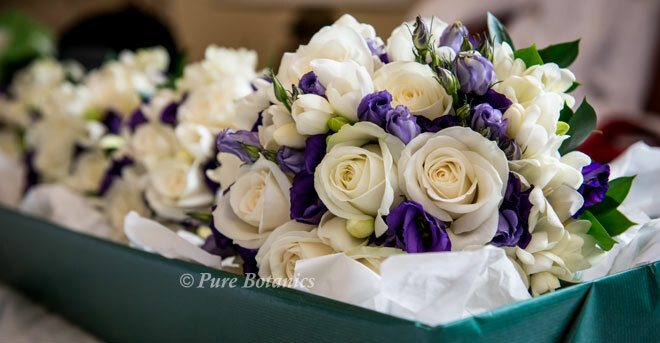 I used these to create all of the bridal bouquets, buttonholes, ceremony flowers and table centrepieces. You can see her above flanked either side by a gents in top hats as she makes her entrance down the aisle. Ian looks like he can wait for her to arrive. 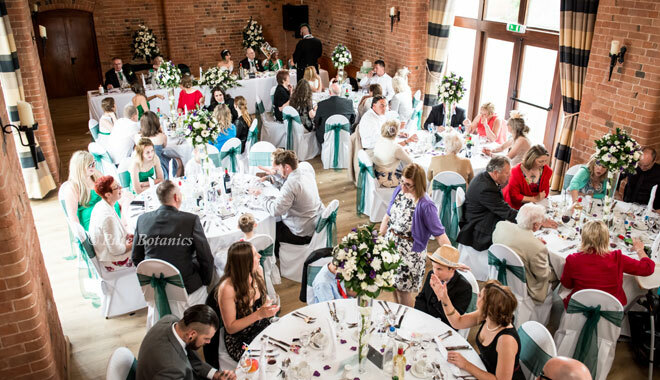 The high ceiling at Ingon Manor really suited our tall table arrangements and the ivory and green stood out perfectly against the red brick of the interior. There were personal touches everywhere at this wedding from a large wedding banner at the entrance to skulls on the table and wedding cake. I think its great when people really add their own unique style and personality to a wedding. 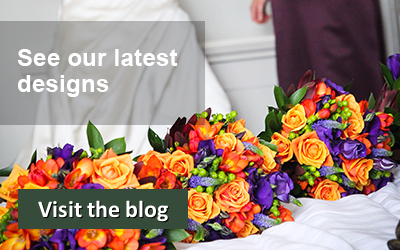 I work with all sorts of people with all sorts of ideas and it’s my job to create the style and type of wedding flowers that suits their wedding day. 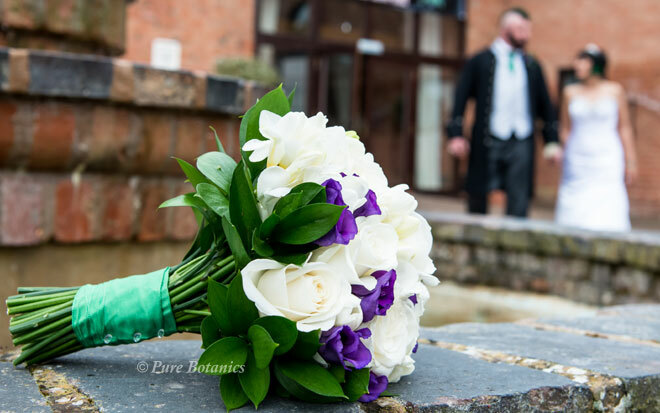 I thoroughly enjoyed working on Sara and Ian’s wedding flowers. 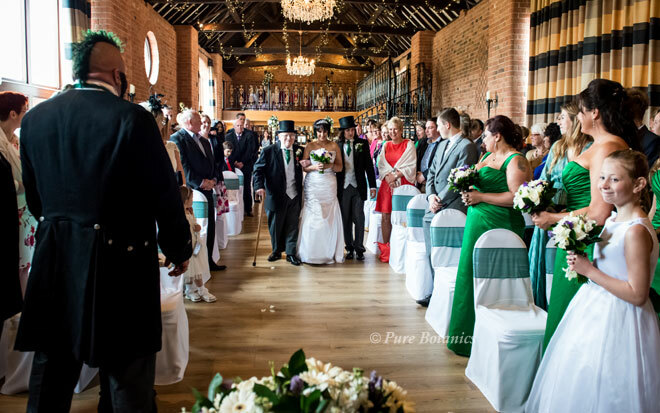 I was also delighted when Sara came into see me to share her fabulous wedding photos that you see here.